The Stoa (a portico or a roofed colonnade) of Attalos is a magnificent structure initially built around 150 B.C. The Stoa was built by King Attalos II of Pergamon as a gift to the Athenians in an appreciative gesture for the time he spent studying under philosopher Karneades while at Athens. It was destroyed at the hands of the Herulians in A.D. 267. It was then discovered during the excavations carried out by the Greek Archaeological Society between 1859 and 1902. Later on, as recent as 1953 to 1956, the Stoa of Attalos was re erected to its former glory. Having two floors, the ground floor is open to public and has on display sculptures and marble artefacts. 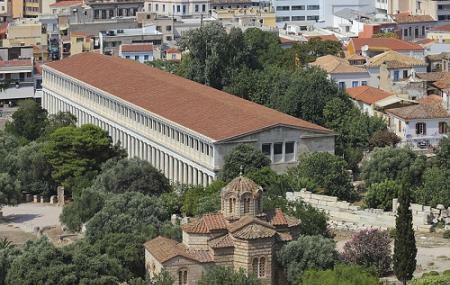 It also houses shops and the Museum of Ancient Agora. The first floor is used for the excavation offices, workrooms, and archives as well as for additional storage. The Stoa of Attalos was built by King Attalos II of Pergamon (159–138 B.C.) as a token of appreciation to the native Athenians. This elaborate stoa (a covered walkway or portico) features classical Greek architecture. The stoa has a large two-storeyed double colonnade (a row of evenly spaced columns) and is 116 meters long. The stoa has 42 shops in all. In the mid-20th century, the stoa was restored. Today this building id used as a place of public gathering and has a market. There is also a museum here that houses some of the historically important Athenian artefacts. Check the official website or local tourist centre in Athens for more ticket prices. How popular is Stoa Of Attalos? People normally club together Numismatic Museum Of Athens and Ancient Agora while planning their visit to Stoa Of Attalos. Especially liked the statue of Alexander the Great on the second floor. Below are two pictures I took there. One is of Alexander and the other it's how I imagined the ancient stoa back in the day. The place is spacious, not crowded and we'll designed. And most of all it is picturesque. Explore the museum's fairly representative collection of artifacts from various time periods. Stunning location, incredible architecture. A must see for a tourist (and entry is heavily subsidised for students). The building is a reconstruction of the original Stoa and it houses a museum of many ancient relics. One of my favourite places in Athens and was part of the ancient agora. This was rebuilt around the start of the millennium and was opened to mark the expansion of the EU. It's a small but fascinating mueseum. It's also on the same site as the temple of hephaestus which is my favourite temple in Athens along with the temple of Poseidon in sounian. This is a new building built a few decades ago. Sculptures and other exhibits can be organized better. Metro passes near the building.